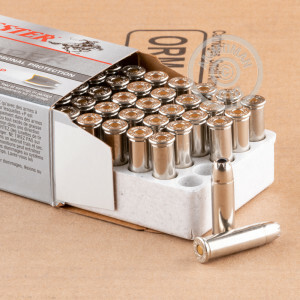 This bulk pack of 500 .38 Special rounds will be a great addition to your defense ammo stash and give you plenty of ammunition to practice with. These rounds are loaded to +P pressures so make sure your revolver or lever-action carbine is rated for the same before firing. 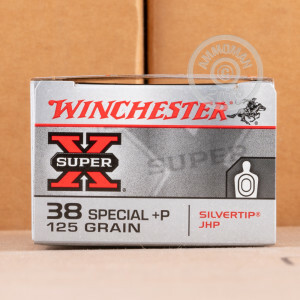 Winchester's Super-X line focuses on enhanced terminal performance in hunting and personal defense ammunition. 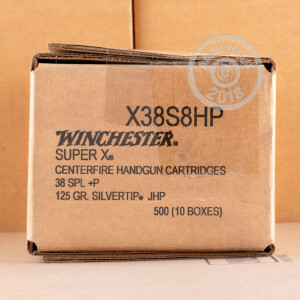 These rounds are assembled from reloadable brass casings, non-corrosive Boxer primers, and Winchester's own Silvertip bullets. Silvertip projectiles possess a conical curvature for reliable fit and loading with any manufacturer's cylinder and forcing cone. They are jacketed hollow point (JHP) bullets which will expand on impact and create threat-stopping wound channels. The 125 grain weight is on the lighter end for this caliber and delivers a recoil impulse that is easily managed even with small framed pocket revolvers. The bullets travel with a relatively flat trajectory with and the increased pressure helps them expand more reliably when fired from short barrels. When fired from a 4-inch barrel, these rounds move at 945 feet per second while possessing 248 foot-pounds of energy.